Two images have been haunting me of late. I don’t mean that each has, but rather what one has to do with the other. A Methodist minister helped me see their entanglement; it haunts me. 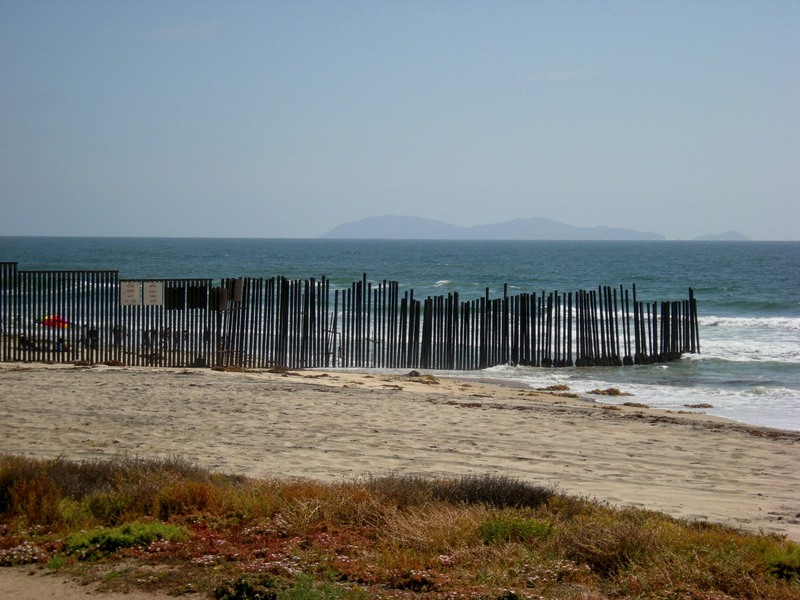 The first image is a massive fence jutting out from the west coast into the Pacific Ocean right at the U.S./Mexico border; that fence marks the border itself. This fence also sits in a place rather hopefully called “Friendship Park.” First Lady Pat Nixon dedicated that park in 1971 and declared her hope that one day the fence would come down. Imagining a First Lady saying that today is not only difficult politically but also logistically as the Department of Homeland Security has been dismantling the park to build a better fence. The second image is a religious fence, the kind that marks the boundary between the Eucharistic Table and the rest of a church building, where the lay people sit. Not every church building has one of these, but many do, and while the meaning of this kind of fence varies, its message is uncomfortably clear: Access to Holy Communion, just like access to the United States, is restricted. These two images share something else in common for me. They represent a significant change of heart and mind concerning immigration and Eucharist. Again, I don’t mean a change concerning both, separately. I mean a change concerning both, together. To be clear, I used to approve of fairly restrictive approaches to both immigration and the Eucharist, and for much the same reason: my appreciation for systems, logic, and law – or more biblically, what Paul described as doing things “decently and in order” (1 Cor. 14:40). It made no sense to me that people here in the U.S. “illegally” should have access to health care or education, just as it made no sense to me that the “unbaptized” should have access to Holy Communion. I used to care so much about making sense for multiple reasons, not least these: the urge to manage for fear of chaos and the need to control for fear of scarcity. I can’t say that I changed my mind about these things at exactly the same moment, but I did so for mostly the same reason: God’s outrageous generosity and scandalous grace. Think of it this way: “illegal” immigrants are the wrong kind of recipients for services intended for citizens, just as the “unbaptized” are the wrong kind of recipients for food intended for the initiated. Now think about the Hebrew Bible and its exhortations about treating “aliens” in the land with hospitality (Lev. 19:34, among many other references), and think about the Christian Testament and its stories about Jesus eating with tax collectors and sinners (Mt. 9:10-11, among others). More simply: Christian faith began with stories about Jesus eating with the wrong kind of people. This radical social practice continued with the earliest Christians, who frequently found themselves in jail for disturbing the status quo (Acts 16:19-24, among others). It’s high time Christians got in trouble again, at both our Eucharistic tables and our international borders. And indeed, at least one Christian minister does both at the same time. When DHS began dismantling Friendship Park, the Rev. John Fanestil, an ordained minister in the United Methodist Church, started crossing construction lines every week at that park, presiding at the Eucharist, and passing the elements of Communion through wire gaps in the fence. Imagine someone completely unfamiliar with Christian history. Imagine this person reading for the first time these ancient [Gospel] stories of extravagantly if not wantonly hospitable meal sharing. Then imagine introducing that same person to the institution that preaches from those stories yet regulates and governs who may and may not participate in its shared meals. Would this not seem bewildering? Who could blame such a person for failing to see any connection between the ancient texts and the contemporary institution? Now imagine someone unfamiliar with American history and politics. Imagine ta king that person to visit the Statue of Liberty in New York Harbor and reading the Emma Lazarus poem inscribed on its pedestal: “Give me your tired, your poor, / Your huddled masses yearning to breathe free…” Would that person really believe that the statue in New York and the fence in southern California belong to the same country? All of this has been resurfacing in my thoughts recently for two reasons. First, the 2016 presidential election has already begun and we have to listen to debates about whether people like Columba, Jeb Bush’s Latina wife, “belong” here but not whether folks like Canadian-born Ted Cruz do. And second, alas, this summer’s General Convention of the Episcopal Church narrowly defeated a resolution that would have established a task force to address the question of an “open table” – receiving Eucharist without first being baptized. That resolution at the General Convention was actually quite modest. Its explanatory text suggested that while the pattern of moving from baptism to Eucharist remains normative, sometimes God calls people into communion in the other direction, from the Table to the Font. I mean, seriously, of course God can call anyone into Communion in any way God chooses. In fact, there isn’t any “normative” pattern for such calling anywhere in the Bible! Not only do the Gospel writers present Jesus as dispensing entirely with religious rules about shared meals, the Acts of the Apostles depicts the Spirit being poured out rather scary people who weren’t even baptized (Acts 10:44-47 as just one example)! Thus I’m haunted by that morsel of bread passed through the wires of a chain-link fence – an image rich not only with God’s border-shattering grace but also God’s challenge to border -keeping institutions. Open tables and open borders – why are these so scary? In Part 2 of these reflections, I’ll suggest some reasons why, especially the reasons that used to scare me.